About Us: ND Care Nirogam Pvt. Ltd.|World-Renowned Ayurvedic Treatment. ND CARE NIROGAM (P) LTD. has steered through 18 years of winning laurels and glories in the domain of Ayurveda. We provide natural solutions for chronic health ailments such as HIV, cancer, infertility, arthritis, liver, and kidney diseases etc. We focus on the promotion of natural healing methodologies by amalgamating the use of knowledge, expertise, and experience to provide time-tested solutions (from ancient texts of Ayurveda) for various dreadful ailments. We have been one of the fastest growing business groups in India and overseas in the Ayurvedic domain. We are registered with the Government of India and recognized Internationally for our exceptional contribution in providing world-class healthcare services. We promote herbal remedies embedded in Ayurvedic scriptures. Our team of qualified doctors and healthcare professionals have a sound belief in mother nature as a storehouse of healing powers. We are focused to disseminate the traditional healthcare system of India to manage various health disorders. We create awareness about advanced research, development in complementary medicines, and its application in the treatment of chronic health ailments. Our brand name NIROGAMTM is universally recognized and we have become world’s leading healthcare service providers. We are pioneers in establishing a chain of Panchkarma healthcare centers that aim to serve treatments for physical, emotional, and psychological ailments. Our approach is to deliver a research-based, highly innovative, out-of-the-box, and authentic Ayurvedic herbal treatments for life-threatening ailments. ND CARE NIROGAM (P) LTD. is a value-based organization whose morals and ethics reflect its responsibility to the profession. Our solid repute and values have been the hallmark of our progress. NIROGAM is focused on providing best healthcare solutions around the globe through a network of 11 Ayurvedic healthcare centers, equipped with highly effective and quality oriented medicines. We also export herbal supplements worldwide to the countries such as USA, UK,Europe, Australia, Africa, Hong Kong, Malaysia, Philippines, and Singapore etc. The saga of the success of an organization is known by the one, who leads, guides, and mentors while, being a source of inspiration for all the individuals working with him. Dr. NAVDEEP SHARMA is a globally renowned Ayurvedic healer. 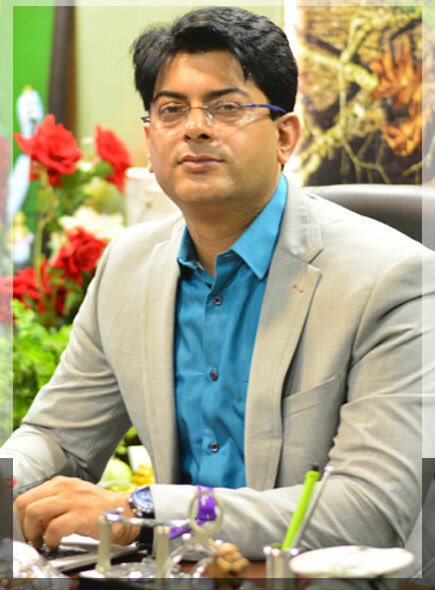 He is the founder and current MANAGING DIRECTOR of ND Care Nirogam Private Limited, Amritsar, Punjab, India. With his vast clinical experience of more than 20 years, he has treated thousands of patients suffering from chronic ailments such as HIV, Cancer, Infertility, Arthritis, Liver, and Kidney Diseases etc. Ph. D. (Submitted ) in Human Psychology from the Department of Psychology, OPJS University, Churu, Rajasthan, India. M. Sc. (Post-Graduation) in Counselling Psychology from the Department of Psychology, University of Madras, Chennai, Tamil Nadu India. B.A.M.S. (Graduation) Shree Lakshmi Narayan Ayurvedic College (recognized by Central Council of Indian Medicine and Ministry of Ayush, Govt. of India and is affiliated to Guru Ravidas Ayurved University Hoshiarpur, Punjab, India. ), Amritsar, Punjab, India. Early education from DAV Public School, a highly reputed institution of the holy city of Amritsar. Where he learnt the valuable lessons of 3D’s ---- Discipline, Dedication, and Devotion under the able guidance and strict vigil of Principal & eminent educationist, Mrs. V. Puri. Invited speaker for the topic, “The Role of Various Herbal Remedies and Dietary Supplements for the Treatment of Depression and Anxiety Disorders” Sharma, N. (2016), at the conference of “Mental Health and Elderly Care” held at Middlesex University, London, U.K during 21-22, October 2017. 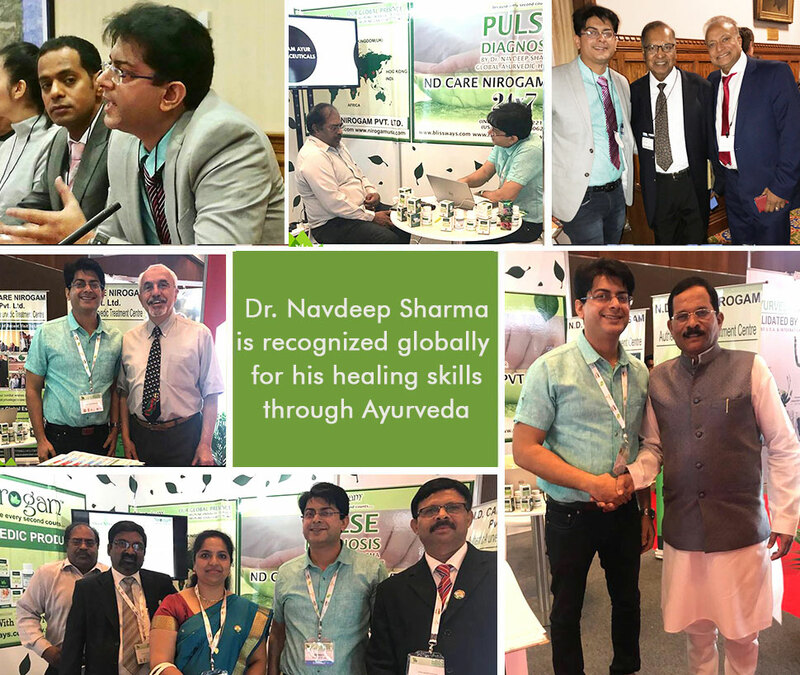 More recently, Dr. Navdeep Sharma represented India at the British Parliament, during his talk on “The Role of Ayurveda in Modern Health Care System". During his talk, he emphasized on up taking Ayurveda as a mainstream treatment system in the UK. Dr. Navdeep Sharma is a staunch believer of Nature’s healing power. To spread the knowledge of Ayurveda, the traditional healthcare system of India, he has been working with utmost dedication and commitment. During the initial phase of his career, he worked with Autistic Children. This experience propelled him to further study Ayurvedic domain for the betterment of his patients. Having a thorough knowledge of human anatomy and physiology both from the Ayurvedic and modern perspective, Dr. Sharma believes that human race should harness the bounties of nature to create harmony among different elements within themselves and the universe. A philanthropist, at heart, Dr. Sharma conducts free camps and health check-ups. He is also associated with various NGOs like Ramakrishna Centre, Vivekananda Centre,and Sarva Dharma Sewa Society etc. His skills of Naadi Pareekshanam (Pulse Diagnose) have significantly benefited mankind. With an upsurge in the number of unsatisfied patients due to the mundane approach of using pharmaceuticals to treat/ suppress a specific disease, Dr. Navdeep believes that it is a social responsibility of Ayurvedic and Natural Sciences practitioners to make available our ancient old remedies to promote longevity. Despite his busy curriculum, he regularly carries out OPD’s at various centers of our company, across the globe. Ayurveda is a 5,000-year-old system of natural healing and has its origins in the Vedic culture of India. Currently, this medical field is enjoying a major resurgence in both its native land and across the globe. While the Tibetan Medicine and Traditional Chinese Medicine both have their roots in Ayurveda, the early Greek medicines also embraced many concepts originally described in the classical Ayurvedic medical texts dating back to thousands of years. Like a true Ayurvedist, Dr. Navdeep Sharma also believes in the purity of body, mind, and soul. Success is a hard taskmaster, a demanding, high-maintenance mistress which needs absolute dedication and single-minded pursuit. As an entrepreneur, Dr. Navdeep Sharma is a workaholic who constantly thinks about work. Extremely dynamic, he seems to be blessed with an inexhaustible store of energy. Dr. Sharma is a person with a sharp and unrelenting focus, always striving to achieve new goals and scale newer heights. Dr. Navdeep Sharma leads a disciplined life while keeping an enviable balance between work and his life. Dr. Navdeep Sharma is also a great learner who believes that there is no such thing as mistakes, only lessons to be learned. Ayurveda, the world’s oldest oriental healthcare system is now fast reaching and making its presence felt in the occidental world where the people are now turning to this system for its holistic treatment, so essential for creating a perfect balance of body, mind, and soul. Many significant steps in this direction are being taken, one of which was in the form of 4th Svastha International Conference on Ayurveda and integrative Medicine, Organized by the Middlesex University, London in collaboration with college of Ayurveda. It is a matter of immense pride and legitimate honour not only for the city of Amritsar, but also for India and the entire Ayurvedic fraternity that Dr. Navdeep Sharma from ND Care Nirogam, Pvt. Ltd. was invited by the Middlesex University, London, U.K to participate in this conference. The main theme of this conference was “Mental Health and Elderly Care” on 21st and 22nd oct, 2017. The objective behind this endeavor was to develop an evidence based knowledge body of Ayurvedic Medicine to harness the contribution to health, overall wellness and people centered healthcare. Another objective of this conference was to generate a dialogue, find pathways for global use of Ayurveda, integration of Ayurvedic products, practices, and practitioners into the health system. 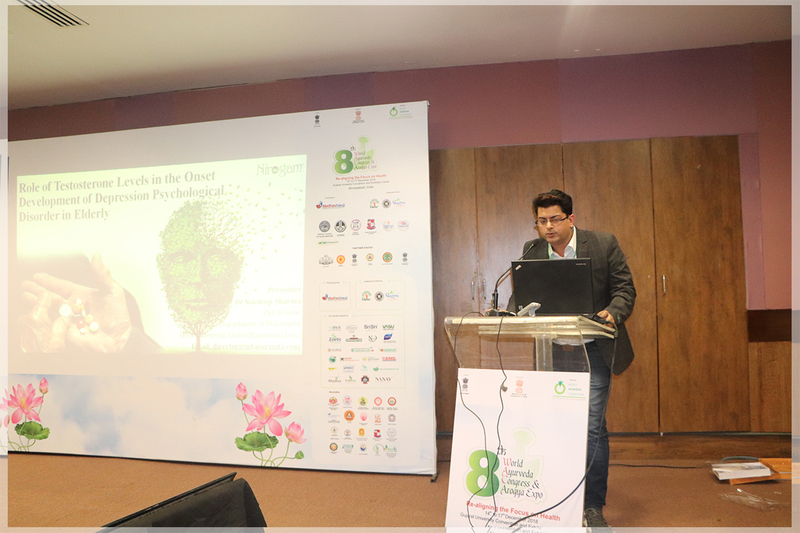 Dr. Navdeep Sharma presented his paper on the “Role of Ayurvedic Herbs in Psychological Disorders w.s.r. to Depression”. The paper was highly appreciated and admired by the global audience. Talking about India’s expertise in alternative medicine and healthcare that goes back to centuries, Dr. Navdeep Sharma said that Ayurveda, the science of life is a holistic science that encompasses a healthy well-balanced life by creating a perfect harmony of body, mind, and soul. Hailing Ayurveda as a holistic science that works for the maintenance of the physical, mental, spiritual growth, and well-being of an individual, Dr. Navdeep Sharma put forth his request to the British Parliament to uptake Ayurveda as a main stream treatment system in U.K. Dr. Navdeep also emphasized that Ayurveda should be a part of the academic curriculum right from the school level as it has a definite edge over other existing sciences in the treatment of many life-threatening ailments. The August gathering at the British Parliament comprised Sh. Amarjit S. Bhamra- Lead Secretariat All Party Parliamentary Group, Indian Traditional Sciences, U.K, Eshan Gur Sakra Prof. Christan H.S, Sri Lankan Representatiive, Mr Kevler- University Medical Centre, Berlin, Dr. Pradeep J. Bharacharya, Manminder Dhami, Member Ayurvedic Practitioners Association, Carlsberg, U.K, Dr. Premadani from Premadani Ayurvedic clinic, Netherland, Dr. Madan DNA, Research Dept. University of Cambrigde, Yashvardhan Kumar Sinha, Indian High Commissioner, London, U.K. Dr. Navdeep also talked about the concept and benefits of drinking hot water and Ama related (diseased) conditions. It was Good fortune for the visitors and co-exhibitors that our company actively participated in the Arogya 2017, the first International Exhibition and Conference on Ayush and Wellness from Dec 4 to Dec 7,2017 in New Delhi to showcase the strength and scientific validation of Indian system of medicine in the global context and promote the same at global level. The main theme of the event was enhancing the global potential of ‘AYUSH’. There is a worldwide resurgence of interest in traditional medicines based on herbs and medicinal plants. ASU medicines are gaining popularity in many countries as food supplements. It was significant event in the realm of indian medicine, poised to make waves at a global level. It provided a powerful platform for the ayush scholars, students, for policie makers, and practitioners to not only congregate at the conference but also contribute significantly to promote the five great life sceinces which contribute a lot for a healthy and happy life for mankind at large. “Ayurved Parv” was truly a festival of Health through Ayurved. It provided a great opportunity to not only showcase “Nirogam’s products” but also to interact with great scholars of Ayurveda, and to share their knowledge and experiences. Dr Navdeep sharma was felicitated at this event. Participation in "AYUSH EXPO-2017, Dubai"
The first International Ayush Conference and Exhibition organized by Science India Forum was held at Dubai's prestigious World Trade Centre to disseminate the knowledge of Ayurveda, Yoga, Unani, Siddha, Homeopathy, and thus to convince the world about the healing touch of traditional Indian Systems of medicine. This first ever International Summit in the UAE provided a platform for global Ayush leaders and professionals. The theme of this Conference and Exhibition underlined the need for collaboration and cooperation of public, medical professionals, researchers and Health Policy makers. This effort by the Ministry of Ayush, Govt. of India, served as an update for evolving trends in the practice of Indian Medicine. It was a great opportunity for Dr. Navdeep Sharma, to not only actively participate in the Conference, but also to showcase the products of ND Care Nriogam Pvt. Ltd. in the Exhibition. The year 2018 was a year of new landmarks and enviable accomplishments for the ND Care Nirogam. The company scaled new heights of fame and glory not only at the national but also at the international level. ND Care Nirogam has already established itself and created a niche in the field of healthcare with its highly innovative, out-of-the-box, and authentic and effective healing techniques for various chronic ailments and lifestyle diseases. 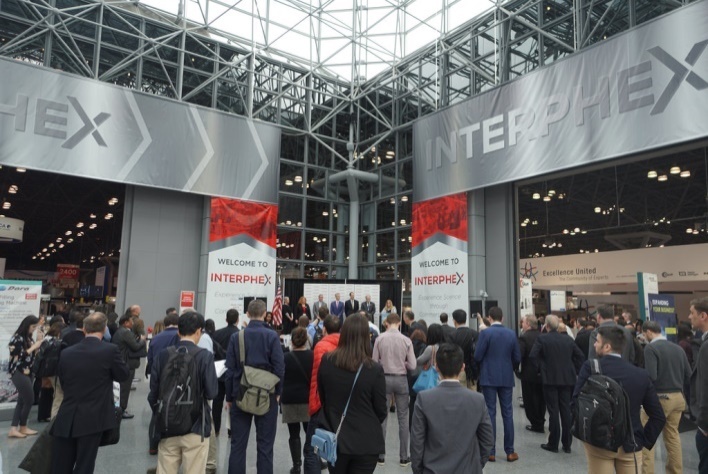 It is matter of immense pride for the ND Care Nirogam for being the first ever Ayurvedic company in the world to have ever participated in the Interphex-NY, an international pharmaceutical Expo, USA, where over 11,000 global industry professionals and 650+ leading suppliers gathered. The aim of this Expo was to leverage, quality, efficiency and cost effectiveness in today’s ever changing global market. 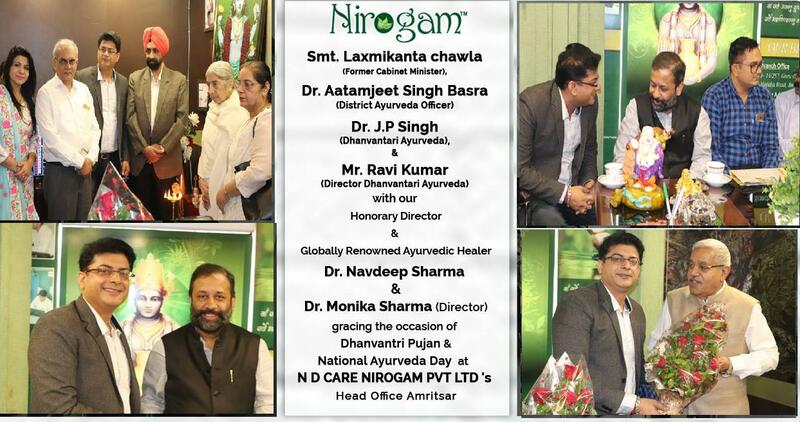 It was really a proud moment for the ND Care Nirogram for having been recognized as a premier institution in offering Ayurvedic products which have been proven to be highly efficacious in dealing with chronic ailments and other modern day life-style diseases. Mrs. Daniela Stan Sion from Romania who visited our company’s corporate office at Mohali to be our new franchise partner with Dr. Navdeep Sharma, IAS officer Dr. Ghuman, Shri. O.P. Sharma and others. ND Care Nirogam Pvt. 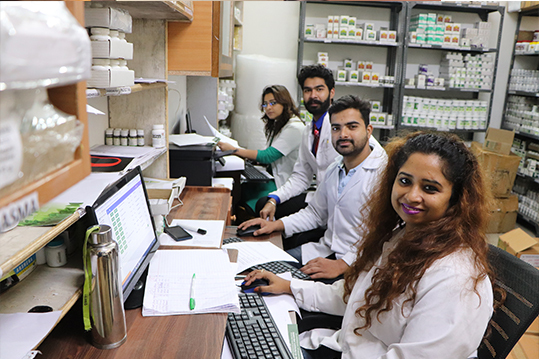 Ltd. has established its World Class Pharmacy at the corporate office Mohali, India. The staff members work hard during day and night to accomplish success for the organization. Diwali 2018 was celebrated with great fanfare. Dr. Navdeep Sharma and Dr. Monika Sharma presented Diwali gifts to all the team members at the corporate office at Mohali. Having received countless requests from all over India, Dr. Navdeep Sharma started his OPD’s at new centers in Jammu, Jaipur, Guwahati, Agartala and Roorkee. Below: A view of one of the OPD’s carried out by ND Care Nirogam Pvt. Ltd. The company celebrates Dhanwantri Diwas every year to worship Lord Dhanvantri, the Hindu god of medicine and Ayurveda and seek His blessings. This year Dhanwantri Diwas was celebrated on 5th November, 2018 at Amritsar center. Laxmi Kanta Chawla, former cabinet minister of Punjab, Dr. Aatamjeet Singh Basra, District Ayurveda officer, Dr. J.P. Singh , Dhanvantri Ayurveda, Mr. Ravi Kumar, Director Dhanvantari Ayurveda participated in the celebrations along with Dr. Navdeep Sharma, Dr. Monika Sharma, Shri. O.P. Sharma and Sudha Sharma. AROGYA EXPO – 2018, AHMEDABAD. Dr. Navdeep Sharma a staunch believer in Nature’s healing power has been contributing sincerely and dedicatedly for the last two decades to promote and propagate Ayurveda not only nationally but also globally in its true sense. Dr. Navdeep Sharma delivering a talk on the topic “Role of Testosterone Levels in the Onset Development of Depression Psychological Disorder in Elderly” at the World Ayurveda Congress (WAC) held at Ahmedabad. Ayurvedic medicines, Ayurvedic doctor, Ayurvedic specialist, Ayurvedic Cure, Herbal Cure, Herbal remedies, natural remedies, Ayurvedic remedies, Herbal supplements, natural supplements, Ayurvedic supplements, Healthcare, Latest Health Care, Healthcare facilities, Natural treatment, Ayurvedic treatment, Ayurvedic clinic, Ayurvedic hospital, Ayurvedic center, Ayurvedic centre, Disease, Illness, Disorder, Ailments, Chronic Disease, Chronic Illness, Chronic Disorder, Chronic Ailments, ayurvedic products for Chronic Disease, ayurvedic supplements for Chronic Disease, herbal products, Ayurveda, , Best Ayurveda center in India/world, Online/Telephonic/personal consultations, 24x7helplines, Customized holistic healing, Ayurvedic consultations, Yoga consultations, Panchkarma consultations, Rejuvenation wing, Panchkarma therapies, Physiotherapy, Meditation, Reflexology Naturopathy, Personalized diet chart., Ayurvedic arthritis treatment medicine, ayurvedic osteoarthritis treatment, rheumatoid arthritis treatment, Arthritis pain Medicine, herbal/home remedies for Arthritis, autism Ayurveda treatment, autism diet, autism alternative therapies, ayurvedic medicine for autism, herbal/home remedies for autism, ayurvedic medicine for cancer, herbal/home remedies for cancer, depression cure, depression attack, anxiety, Ayurveda for depression, diabetes ayurvedic medicine & treatment, ayurvedic treatment epilepsy seizures fits attacks, best medicine for epilepsy seizures fits attacks, mirgi ka illaj, Hepatitis Ayurvedic Treatment, Hepatitis Ayurvedic medicine, HIV/AIDS Ayurvedic Treatment, HIV/AIDS Ayurvedic medicine, Herbs for HIV/AIDS, irritable bowel syndrome treatment in Ayurveda, irritable bowel syndrome medicine in Ayurveda, IBS diet, leucoderma Ayurveda medicines, leucoderma Ayurveda treatment, migraine attack ayurvedic treatment, obesity medicines/treatment in Ayurveda, ayurvedic paralysis treatment, piles ayurvedic medicine and treatment, psoriasis cure Ayurveda, ayurvedic medicines for psoriasis, ayurvedic treatment for hyperthyroid, Ayurvedic medicine for thyroid, best health care solution, health disorder, dr. navdeep sharma, ayurvedic domain, Best Ayurvedic Doctor in India, Dr. navdeep, Dr navdeep Sharma, Ayurvedic Navdeep Sharma, Ayurvedic Doctor Navdeep, Best Ayurvedic Doctor in World Best Ayurvedic Doctor in Chandigarh Best Ayurvedic Doctor in Mohali Best Ayurvedic Doctor in Amritsar Best Ayurvedic Doctor in Pune Best Ayurvedic Doctor in Bangalore Best Ayurvedic Doctor in Delhi Best Ayurvedic Doctor in Ahmedabad Best Ayurvedic Doctor in USA Best Ayurvedic Doctor in Canada Best Ayurvedic Doctor in Australia Best Herbal Healer Doctor in Kenya Best Herbal Healer Doctor in South Africa psoriasis cure Ayurveda, ayurvedic medicines for psoriasis, ayurvedic treatment for hyperthyroid, Ayurvedic medicine for thyroid, best health care solution, health disorder, dr. navdeep sharma, ayurvedic domain, yurvedic medicines, Ayurvedic doctor, Ayurvedic specialist, Ayurvedic Cure, Herbal Cure, Herbal remedies, natural remedies, Ayurvedic remedies, Herbal supplements, natural supplements, Ayurvedic supplements, Healthcare, Latest Health Care, Healthcare facilities, Natural treatment, Ayurvedic treatment, Ayurvedic clinic, Ayurvedic hospital, Ayurvedic center, Ayurvedic centre, Disease, Illness, Disorder, Ailments, Chronic Disease, Chronic Illness, Chronic Disorder, Chronic Ailments, ayurvedic products for Chronic Disease, ayurvedic supplements for Chronic Disease, herbal products, Ayurveda, , Best Ayurveda center in India/world, Online/Telephonic/personal consultations, 24x7helplines, Customized holistic healing, Ayurvedic consultations, Yoga consultations, Panchkarma consultations, Rejuvenation wing, Panchkarma therapies, Physiotherapy, Meditation, Reflexology Naturopathy, Personalized diet chart., Ayurvedic arthritis treatment medicine, ayurvedic osteoarthritis treatment, rheumatoid arthritis treatment, Arthritis pain Medicine, herbal/home remedies for Arthritis, autism Ayurveda treatment, autism diet, autism alternative therapies, ayurvedic medicine for autism, herbal/home remedies for autism, ayurvedic medicine for cancer, herbal/home remedies for cancer, depression cure, depression attack, anxiety, Ayurveda for depression, diabetes ayurvedic medicine & treatment, ayurvedic treatment epilepsy seizures fits attacks, best medicine for epilepsy seizures fits attacks, mirgi ka illaj, Hepatitis Ayurvedic Treatment, Hepatitis Ayurvedic medicine, HIV/AIDS Ayurvedic Treatment, HIV/AIDS Ayurvedic medicine, Herbs for HIV/AIDS, irritable bowel syndrome treatment in Ayurveda, irritable bowel syndrome medicine in Ayurveda, IBS diet, leucoderma Ayurveda medicines, leucoderma Ayurveda treatment, migraine attack ayurvedic treatment, obesity medicines/treatment in Ayurveda, ayurvedic paralysis treatment.